Invigorating, even messy pandemonium: this was the character of print culture at the time of this novel’s publication, in 1810. Without a doubt, Rosa proves itself to be a metanarrative due to the author’s complex relationship with such pandemonium: he or she incorporates criticism, satire, exploration, celebration, and even bewilderment as the characters go about their journeys in the storyline. Really, the characters cannot escape the language that swirls through the air; it is part of their identity in the setting of this new country; it is part of who they are on the most fundamental of levels. Even if the characters themselves do not contribute to journals, they chatter together, trying to make sense of the traditions they inherited from Great Britain, trying to find the bits of truth in the sensationalized, trying to accept the criticism of visionary youths, and trying to make their generation and thus national identity distinctive but always tasteful. Ultimately, something drastic is unfolding, and more and more people can begin to help define whatever that is simply because they are on the streets, engaging, breaking the silence. 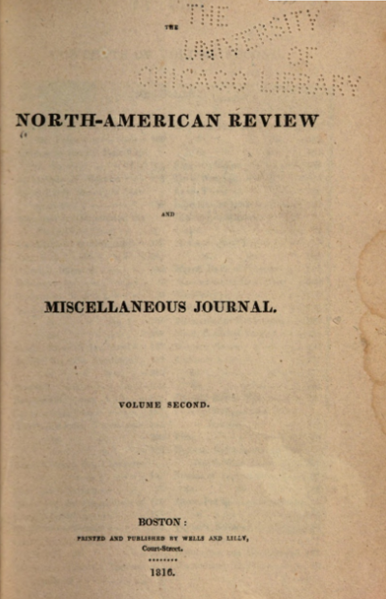 I chose The North American Review, which is considered to be the first literary magazine, for this component of the project, since in it you can clearly see the way that society during the early nineteenth century attempted to embrace a wide variety of pieces while still operating with a set of high standards; a clear structure; and, quite interestingly, metanarrative essence. Although daily life in such buzzing publishing cities as New York, Boston, Philadelphia, and Baltimore brought one into contact with many literary and linguistic influences, at the end of the day, only certain voices and perspectives were selected and captured in literary journals. Thus, from the chaos arose a markedly lucid, scholarly, ambitious body of works. Of course messy snippets from the streets would not make it into the second volume in 1815; the revolutionary poet Walt Whitman was not a prominent figure until later on in the century. 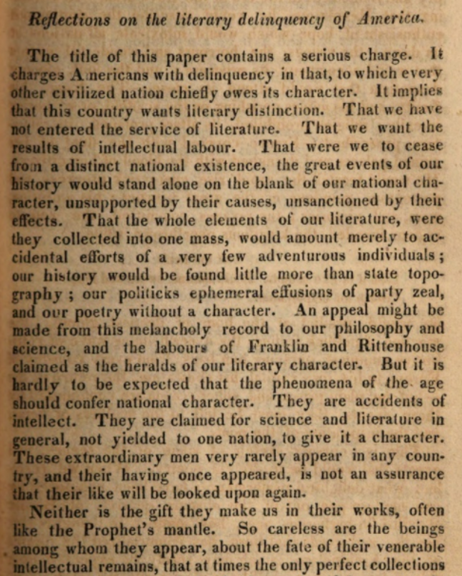 I found this section to be striking and relevant, as there is this sense of resentment towards the blooming literary culture in the years in which the Early Republic was transitioning into its own version of Romanticism and attempting so desperately to define American literature, to establish an unbreakable identity. This is directly related to the metanarrative evident in all throughout Rosa. The anonymous author was, in many respects, concerned with the sort of superficiality that came from overly conscious and almost feverish efforts to pinpoint one particular sort of identity. Many American were making proposals, so to speak, so in Rosa, readers are finally given the chance to recognize the accidental beauty and meaning against such an overwhelming backdrop; the author, as a literary strategy, throws everything into the pot and simultaneously laughs at the absurdity and realizes that perhaps this is precisely what American literature is: an ever-changing pastiche. Ultimately, the characteristics of the American literary consciousness ought to evolve over time, naturally; there must not be too much interference lest we chop off streams that could very well have the potential to define entire movements within this civilization.